Note: Elias Stern resided Apr 18, 1747 in Svihov owned together with his son (same name) house no III and XII in Svihov, where he lived with wife Frandl, little son Abraham, servant Hendl and an apprenitice Lazar Josl. His son Wolf (aka Elias) inherited and owned house no. 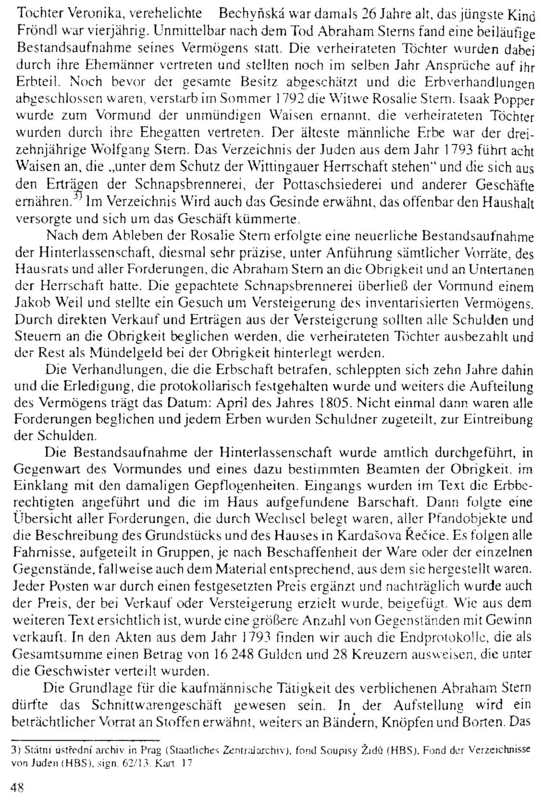 201(III) in Svihov from 1782 until 1798, when his widow sold it to Salomon Sicher OR Jewish census of Bohemia Vol III, p 333: 1793, the Stern family (more than one page) lived in Jindřichův Hradec. There are 23 children listed in the census & the Stern family has their own tutor, cook and domestic staff 6 "inmates" (servants, workers, etc. 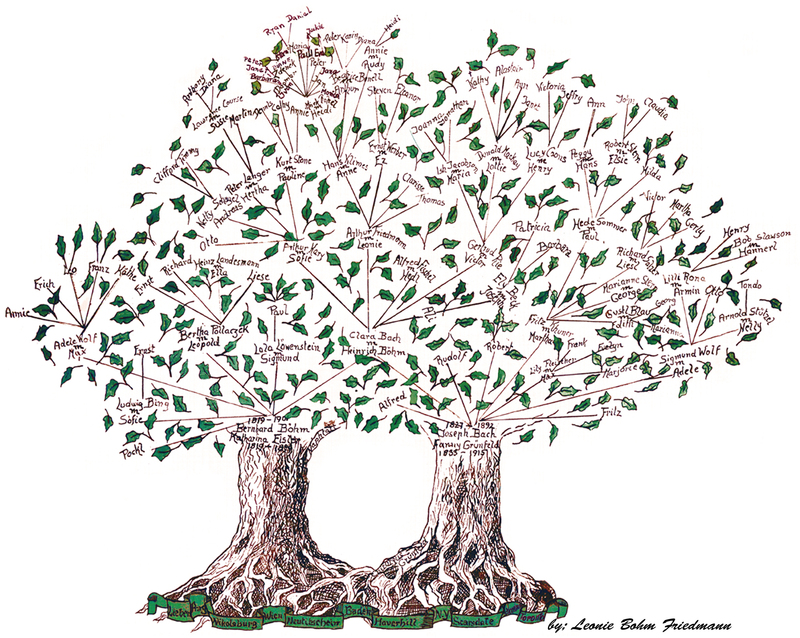 ), one of them Adam Taussig of Prague, possible relative of the host family. The Stern family had economic tentacles throughout Bohemia, Moravia and Hungary OR Town web page "..1797 Josef Alois Landfras zakoupil Hilgardnerovu tiskárnu.. ..1918-1937..K největším závodům patřily textilní podniky: Třebického továrna, Českomoravská továrna majitele Z. Singera. Potravinářský závod E. Hermanna vyráběl sirupy a škrob.." or the Jewish cemetery page, unfortunately no names are listed OR any relation to the other Stern page, descendants of Abraham Stern (1812 Mostek (Tábor? ), CZ -) & Barbora Klineberger (1816 Babčice (Vodice, okres Tábor) map?- ), daughter of Jakob Klineberger & Katharina Lederer? Johanna (aka Anna) STERN Born: abt 1771 + Lazar (see FÜRTH family) Born: abt 1760 Married: 1791 Died: Mar 20, 1844 in Sušice (Schüttenhofen) okres Klatovy, Bohemia. occupation: Merchant. Residence: 1793 Sušice. Family moved to Vrbová Lhota /offic. (Nymburg region), Bohemia? Franziska STERN Born: abt 1779 Residence: 1793 in Třeboň (Wittingau), Bohemia. 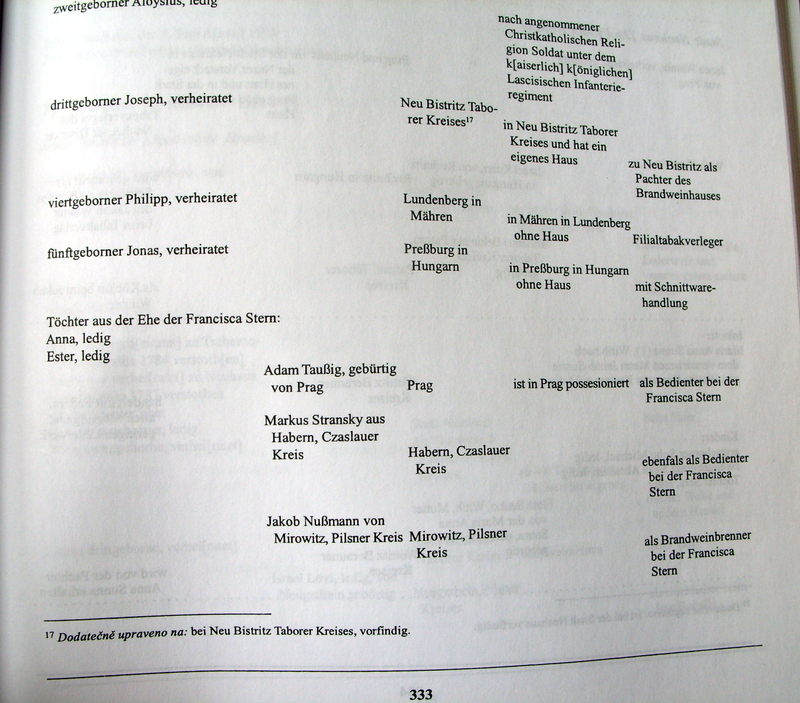 *any relation to Franziska Stern + Salomon Feigl, daughter Johanna (1820 Myslkovice -) + Samuel Posamentir (1806 Myslkovice -) also listed in Note section bottom of page? Anna STERN Born: 1786 in Třeboň (Wittingau), Bohemia. Residence: 1793 Třeboň. Died: Mar 25, 1849 in Chlum u Třeboně (Chlumetz bei Wittingau), Bohemia + Salomon DUBSKY Born: 1788 Died: Feb 6, 1856 in Chlum u Třeboně Father: Jakob Dubsky Mother: Rosalia Rosa (?) *they had 5 children, any relation to Rosalia Dubsky (1843 m. May 14, 1865 Trnava -) + Nathaniel Seger (1834 - 1922/23 on Grünhut research page? Abraham DUBSKY Born: 1815 in Clumec (=Chlum u Třeboně , okres Jindřichův Hradec, Bohemia?) 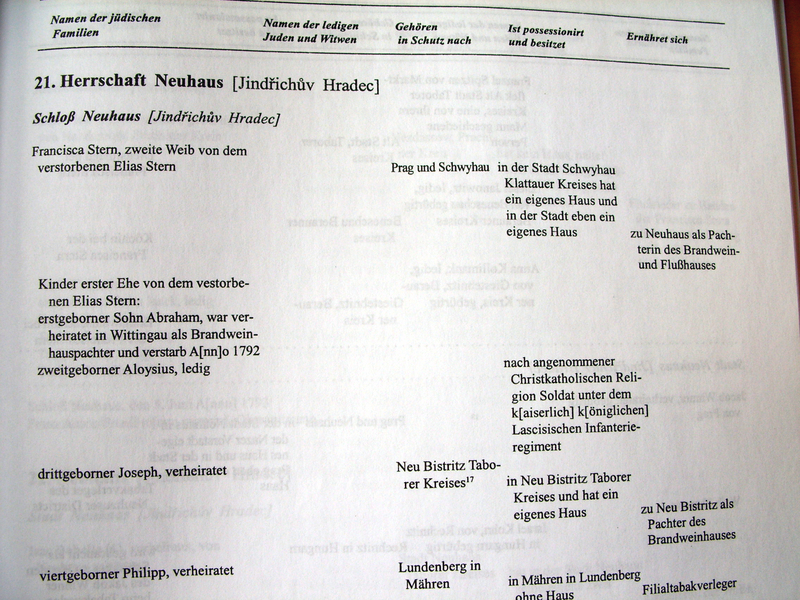 + Franziska (aka Anna Nany) SCHMOLKA Born: 1823 in Lounovice pod Blanikem (Launowitz)., Bohemia. *radio Prague Died: Non 12, 1897 in Prague, buried in Prague Zizkov cemetery: AE Section 6 Row 10 Tomb 1 (Section 6 Row 10 Tomb 1) picture Father: Zacharia Schmolka (Lounovice -), son of Bernhard Schmolka & Lisl (?) Mother: Eva Fuchs (1823 Choltice, Bohemia - Nov 12, 1897) *see also descendants of Abraham Dubsky on Lewitus web site. 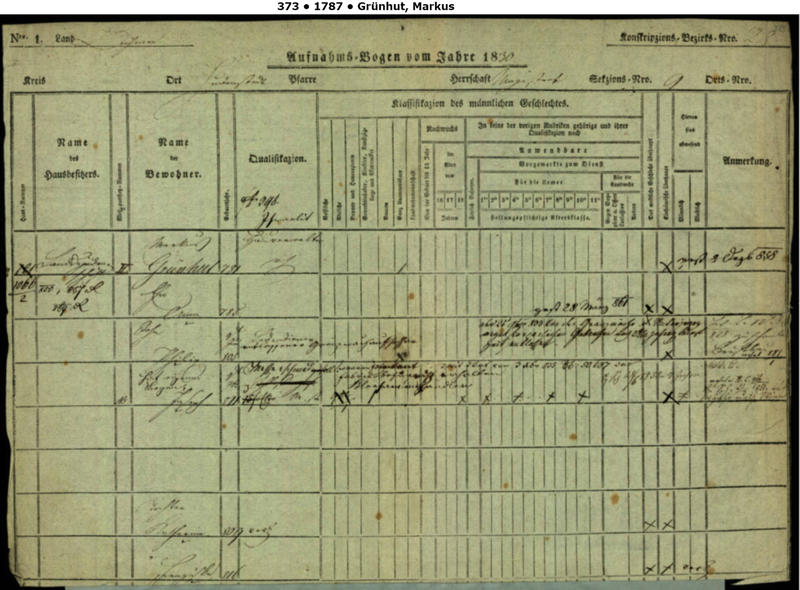 Abraham & Franziska had 11 children OR any relation to Ignatz Fuchs (grain tradesman in Tabor), father of Karoline Fuchs (1874 Tabor m. 1894 Prague - ) on Pollak page? Sofie DUBSKY Born: Jun 25, 1853 *sent wedding cable to the wedding of Theodor Fürth & Grete Grossmann in Vienna Apr 14, 1907 from (Clumec bei Wittingau) =Chlum u Třeboně , okres Jindřichův Hradec, Bohemia? 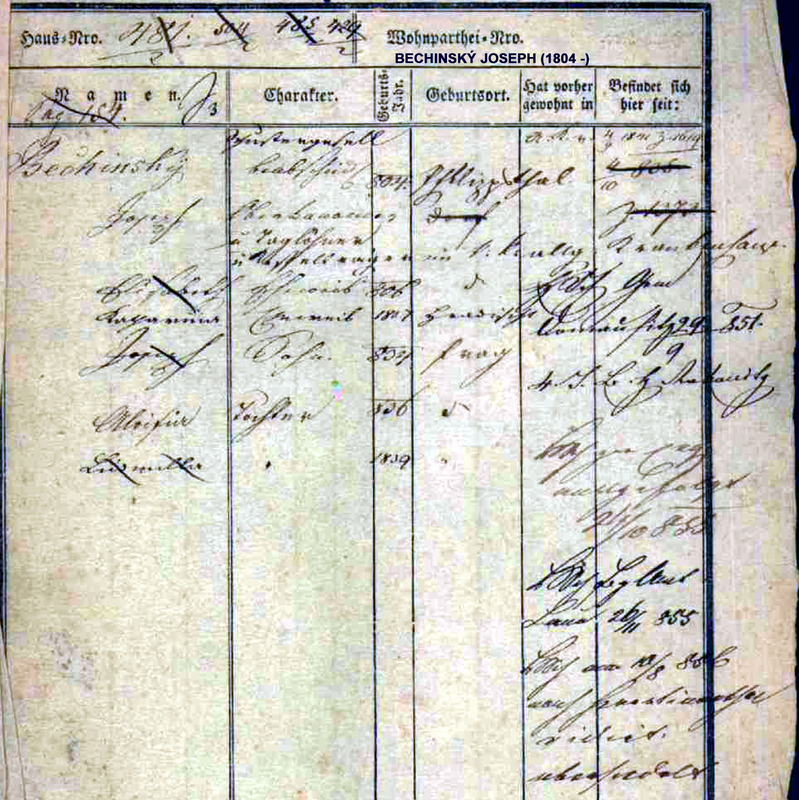 Note: any relation to Therese (see Winter family) (1844 - ) & Sigmund Gottlob (1844 Rousínov /Neu Rausnitz, Moravia - ) "ch. Gabriele (1870 ?Neustadt - )" Prague-cons.card OR Leopold Gottlob (1848 Prostějov /Prosnitz), Moravia - )? Anna DUBSKY	Born: 19 Apr 1901 in Letňany =Prague, Bohemia. Died: Oct 1944 in Auschwitz concentration camp, Poland age 43 est + Aprad KAFKA	Born: 11 Mar 1892 in Budapest, Hungary. Died: Oct 1944 in Auschwitz age 52 est. Marie KAFKA	Born: 16 Jul 1928 in Prague. Died: Oct 1944 in Auschwitz PL	age 16 est. 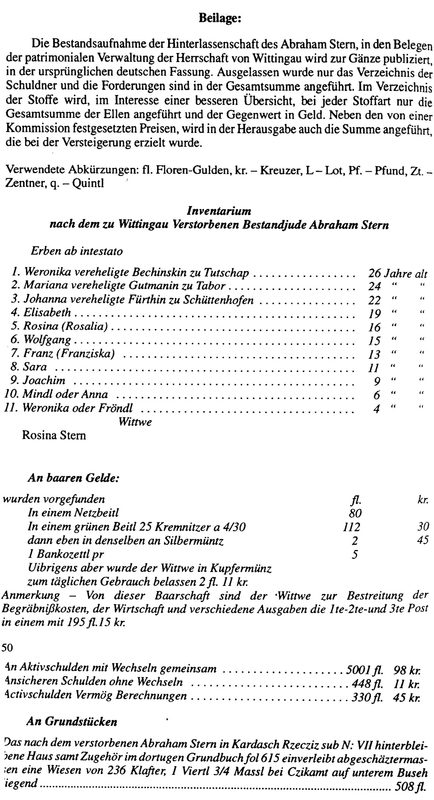 Note: in 1793, the Stern family were the only Jew in Nová Bystřice *see Hugo Gold doc. below. 1793 owned a house, 2 servants lived with them: Herman Reczicky from Kollin and Mariana Wienerin from Zelec (Zeltsch) OR see Celia Male Nová Bystřice cemetery site with Wilhelm Stern, possible descendant of Elias Stern of Prague and Jindřichův Hradec (Neuhaus) OR Nová Bystřice Jewish history that mentions: "..Emil Kohn (1821) a Abraham Stern (1827).. ..rabín Hermann Steiner, ušlechtilý, zbožný a velice vzdělaný muž, těšící se neobyčejné vážnosti novobystřických obyvatel (zemř. 1922, pochován se ženou na zdejším židovském hřbitově).. ..Ze známějších novobystřických Židů jmenujme jména jako Wurmfeld (fabrikant, jejich potomek před několika lety zdejší hřbitov též navštívil), Popper, Pachner, Sametz, Fried, Weiss či Spiegel.. ..Gustavem Weissem (do to doby spadali místní Židé pod Staré město). Z představených kultovní obce jmenujme např. Ludwiga Beera a Viktora Katze. Z živností, které místní Židé provozovali, jmenujme na prvním místě Wolfa Podzahradskyho, který v tehdejší Mlýnské, dnešní ulici pálil a šenkoval alkoholické nápoje (asi od r.1850, zemř.1897).. ..V nedalekém Praunšláku pálili lihové nápoje rodina Friedova. Rudolf Fried byl od r.1931 správcem novobystřického panství ve službách židovské rodiny Kernerů z Vídně. Židovští podnikatelé se uplatnili ve zdejším textilním průmyslu. Ludwig Beer vlastnil mechanickou pletárnu, firma Popper syn tkalcovnu od r.1929 a firma Wurmfeld továrnu v Albeři .."
Wolf STERN Born: 1781 in Nová Bystřice + Rosalie MEISL Married: 1803 in Nová Bystřice. source: Narodni archiv, Soupis zidovskych rodin v Cechach z roku 1793 III. 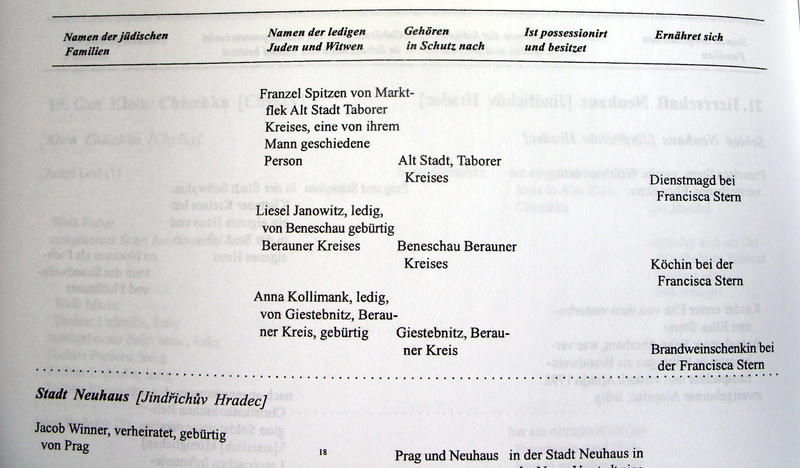 (Praha 2003,), page 333, 369 and Familiantbuch Tabor, HBF 145 Neu Bistritz Nova Bystrice *any relation to the Meissl family on Beykovsky page? Note: belonged in "Protection Prague and Schwyhau" (Schutz Prag und Schwyhau). Lived 1793 in Jindřichův Hradec (Neuhaus), had a house in Svihov (Schwihau), was tenent of the spirit distillery (Pachterin des Brandwein und Flusshauses) in Jindřichův Hradec. 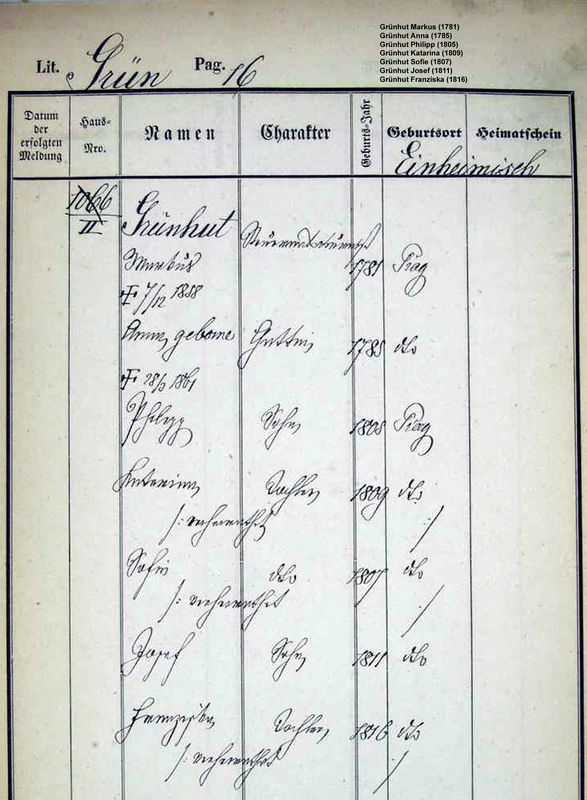 1793 lived with the two daughters Anna and Ester together with the following: Adam Taussig from Prague as servant, Markus Stransky from Habern Czaslauer district also servant, Jacob Nussmann from Mirovice (Mirowitz), Pilsen district as spirit distiller, Franzel Spitzen from von Marktflek Alt Stadt Tábor district as maid, Liesel Janowitz unmarried from Benešov (Beneschau) Beroun district as cook and Anna Kollimank unmarried from Giesteebnitz Beroun district as waiter at the spirit distillery "source Soupis židovských rodin v Čechách z roku 1793 III. page 333"
??? Do the below belong to the Above family ??? 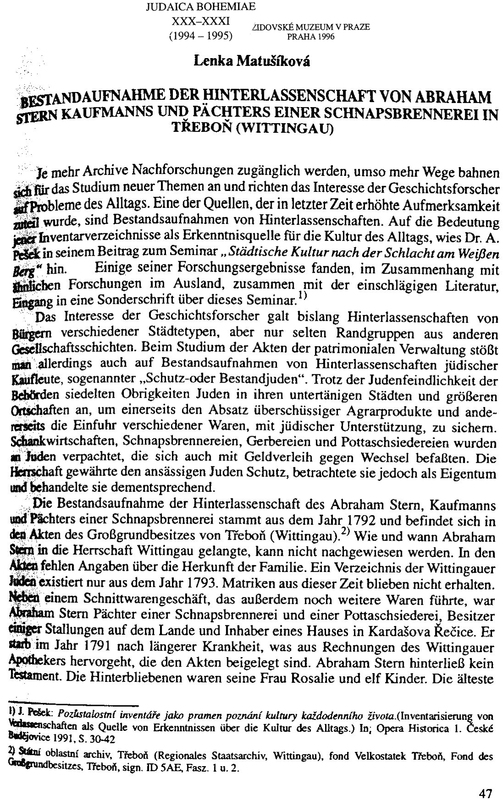 Note: Břeclav Jewish monuments: "..Two scholarly rabbis worked in Břeclav – Mordecai Benet (from 1787 to 1789) and Heinrich Schwenger (from 1911 to 1913). Břeclav was also the birthplace of Julius Lieban (1857-1940), the opera singer. The Kuffner family (see Geiringer page), owners of the local sugar mill, was some of the most prominent figures on the local economic scene.. ..1868 it (synagogue) was replaced by a new temple financed by the mayor, David Kuffner. In 1888 it was renovated by Max Fleischer, a renowned Viennese architect.. The Jewish cemetery.. ..with approximately 400 gravestones, the oldest ones from the beginning of the 18th century.. ..The eastern part of the Cemetery, next to the entrance, is dominated by the majestic tomb of the Kuffner family.. ..The premises of the Cemetery, completed in 1892 according to the design of Franz Neumann, a Viennese architect.."
Note: any relation to families on Jewish Gen, FTJP Family Tree of Jewish People "Samuel Stern" OR Peter Lowe genealogy site OR on Traudie Triebel Gruenwald web site OR this sites Franziska Stern + Salomon Feigl, daughter Johanna (1820 Myslkovice -) + Samuel Posamentir (1806 Myslkovice -) or page of Abraham Stern (1812 Mostek -) + Barbora Klineberger (1816 in Babčice (Vodice, okres Tábor? -), or this site: Mr. (abt 1850/60's -) + Irene Brunner (aft 1835 -), Dodrus Samuel Stern (Kann) + Hanna Oppenheimer ( - 1770's Frankfurt), Eduard Stern (1825 -) + Henriette Rindskopf, Grete Stern (1906 -) of a wealthy family + Arthur Hermann Eskeles (1899 Offenbach -), Michael Stern (1829 - ) of Austerlitz /Slavkov u Brna? , Moravia + Friederike Stern (1843 -) of Kremsier /Kroměříž?, Moravia, possibly same Michael Stern + Friederike Stern, son Gustav Stern (1868 Vienna) + Valerie Reitlinger (1878 Vienna -), Josef Stern, (Tachov, okres Plzeň m. 1850 -) + Julie Hirsch (1822 Tachov -), Katharina Katty Stern (abt. 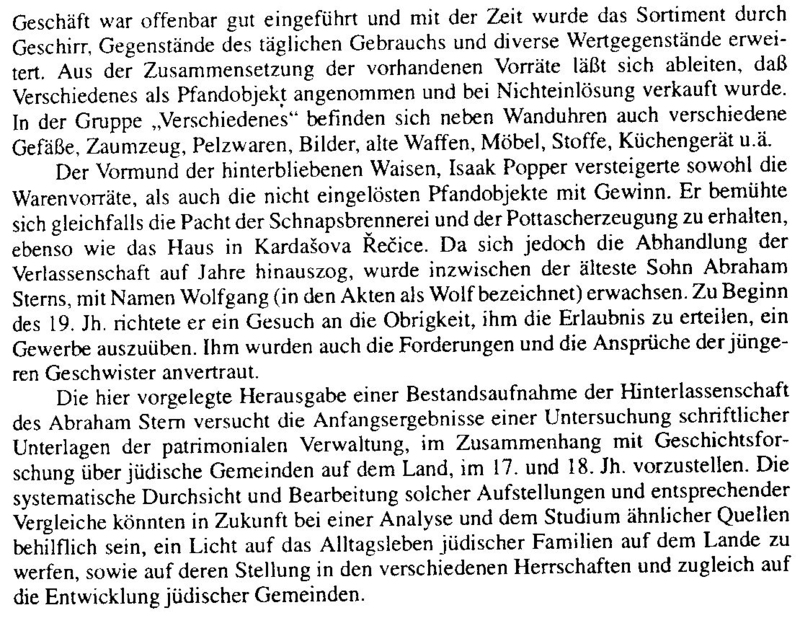 1798/9 Nový Hrozenkov , Moravia -) + Leopold Löwy (bef 1870 -), Max Stern (1 of 8) + Emmy Weiss von Szurda (- buried 1912 Vienna), daughter Marianne Stern (1890 Vienna -) + Georg Khuner (1886 - 1952 Beverly Hills, CA) OR in research Groups on this site: Adelheid Stern + Martius or Martin Grünhut, son Philip + Regine (Regina) Blattner (1826 Prague -), Isack Stern + Mari Fröhlich of Krumau, (Austria? ), daughter Henriete Stern (abt 1828 - 1885 Vienna) + Moritz Geiringer (1826 - 1902 Vienna ) and Anna Stern residence 1871 Vienna + Marcus Klinger of Petrova Ves, Slovakia, daughter Rosalia "Saly" (1843 Petersdorf or abt 1830 -) 2nd wife of Leopold Geiringer?